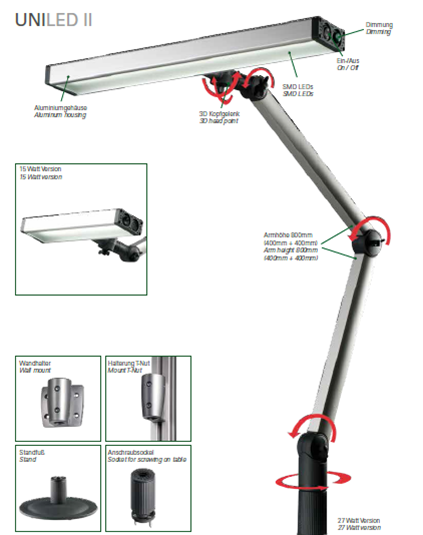 The UNILED II replaces the UNILED articulated-arm lamp introduced in 2011. 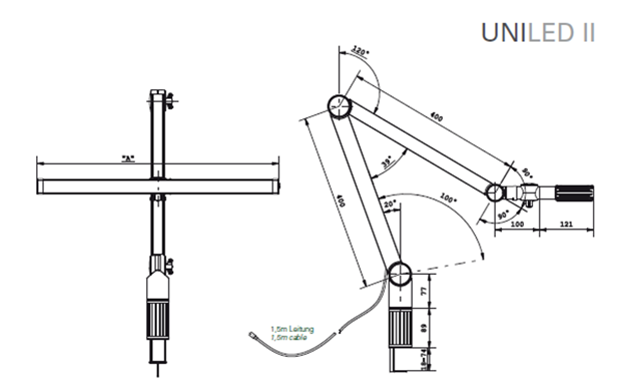 It is characterized by a high-quality aluminium spring arm. The lamp is available in 2 power outputs as well as in 2 different light colours. An infinitely variable and flicker-free dimming is also offered. The UNILED II provides the right lighting for every workplace and for every visual task – with max. up to >6000 lx, at a 50 cm distance. With its ergonomic handling and highly efficient SMD LEDs, the UNILED II provides excellent lighting conditions for workplaces in industry, in laboratories and in the jewellery and watch sector. ⦿ 24V DC connection, M12 sensor connector with 1.5 m cable on the lamp stand. A plug-in power supply unit for direct connection 230V AC and a table clamp are also included as part of the scope of supply.